If you’re looking for a no-holds-barred, thoroughly researched factual eye-opener about “the war on terror” waged in our name, read on. If your taste is more for an edge-of-the-seat, page-turning thriller that grips to the final twist read on. This book will delight both audiences. We all know the post 9/11 world is a very different world from the one preceding it. In the “war on terror” we are facing an enemy that could be living a couple of blocks down the street: An enemy within our own society, a ticking time bomb. As such, most Americans accept the concept of a government flexing its security muscles to monitor its citizens in order to keep them safe. Trading a few civil liberties for the sake of living in a secure country seems like a fair price—until you read Mr Apuzzo and Mr Goldman’s account of the true extent of that erosion, and potentially to no avail. In the aftermath of 9/11, the New York City Police Commissioner Ray Kelly set loose a vast network of undercover officers from its own intelligence unit as part of a sweeping plan to provide the Demographics Unit with the intelligence that might predict where the next home grown terrorists were developing. Known as “rakers” and “mosque crawlers” these officers scoured Muslim neighborhoods, eavesdropping on students, recording mosque sermons, and even listening to chitchat at the local halal deli. Most of it proved worthless, much of it was intrusive, some of it was illegal. But despite all the rule breaking, when three young Muslim men decided to launch a suicide bomb attack on the New York subway, the Demographics Unit failed to hear alarm bells. Mr Apuzzo and Mr Goldman’s first book is an absolute winner. 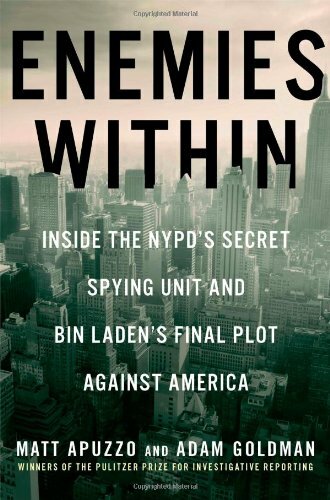 With an engaging, light touch, it walks us through the shady corridors of the NYPD, the FBI, and the CIA as they frantically try to prevent another Al-Qaeda attack on New York City. En route, the Pulitzer prize-winning journalists boldly challenge the methods employed to achieve their goals (including highlighting the fact that the US “prosecuted and executed Japanese soldiers for waterboarding American prisoners” after World War II). Equally, the authors also rightly question the balance between the rights of a suspected terrorist and an innocent’s right to life. In George Orwell’s masterpiece 1984, a perpetual state of war allows the government to manipulate and control its people. Unlike Orwell’s fictitious wars between Oceania, Eurasia, and Eastasia, terrorism is a very real threat and the NYPD and intelligence agencies have a difficult and vital job to do. But without journalists like Mr Apuzzo and Mr Goldman calling those services to account, who is to say whether or not they are abusing their considerable powers?